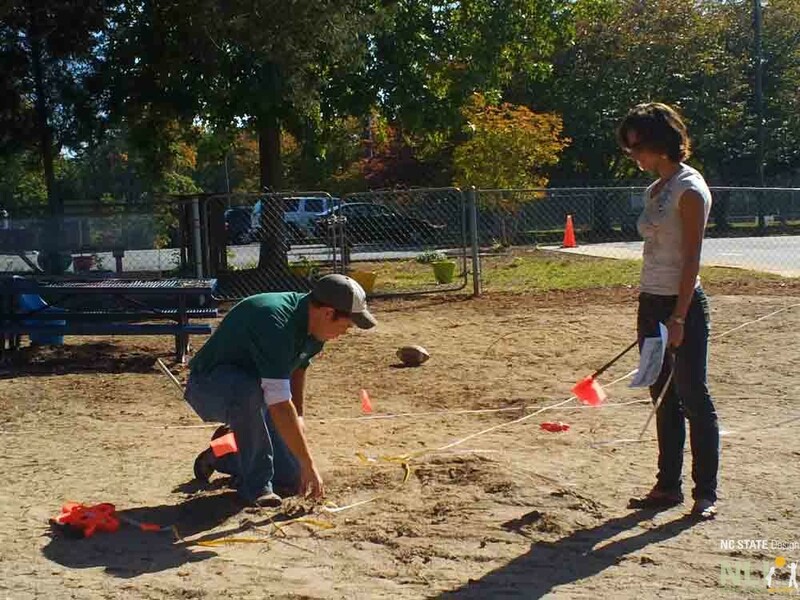 What tools and equipment are commonly used to install outdoor learning environments (OLEs)? Garden tools and equipment are designed for specific tasks. Needless to say, it is important to select the right tool for the task at hand. Using the inappropriate tool can make any task more difficult, and sometimes impossible, to complete. 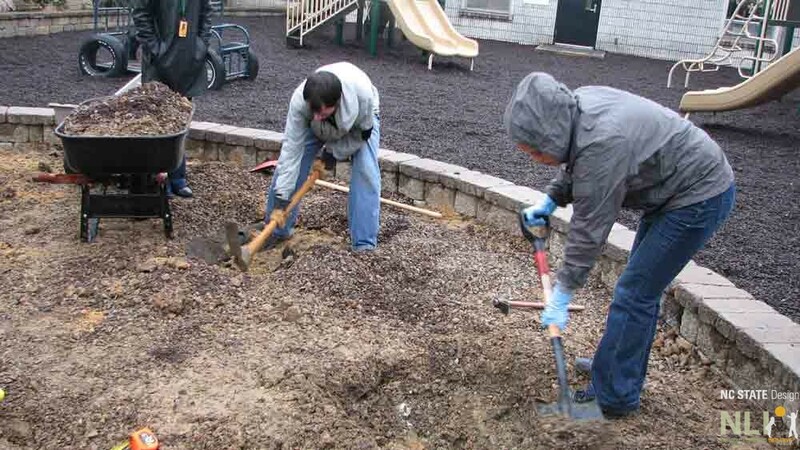 When installing and managing an outdoor learning environment, consider the tasks to be completed and the number and skill level of volunteers required. Review the following list of tools and equipment and determine how many of each are needed based on the tasks to be completed. Ask volunteers to bring tools they may have. 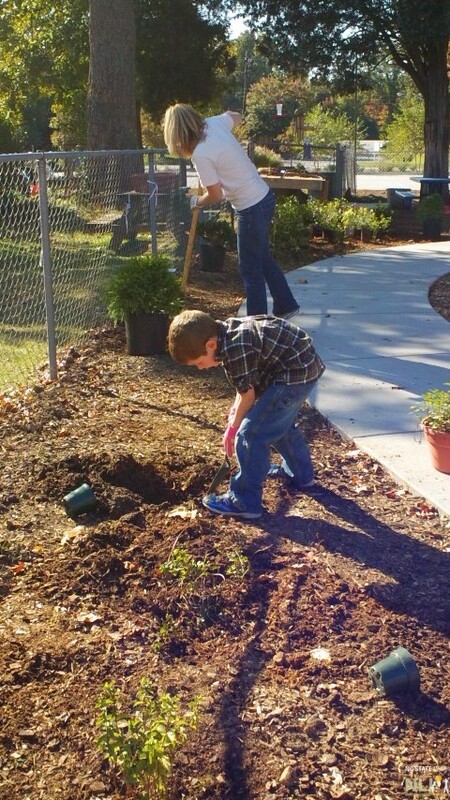 Planting shrubs and perennials at a workday – children can help, too! 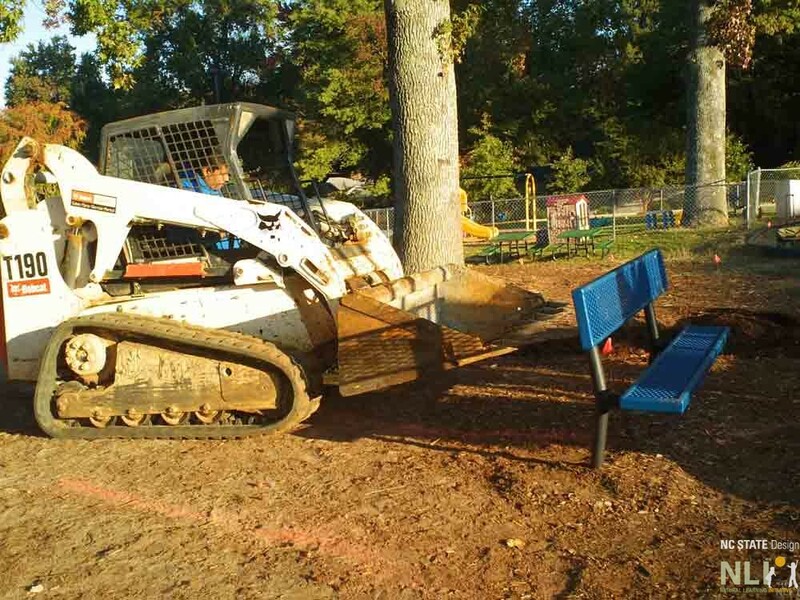 A skid-steer loader (aka Bobcat) preparing to relocate a bench in order to install a pathway. Using survey flags, spray marking chalk and measuring tapes to layout a pathway. 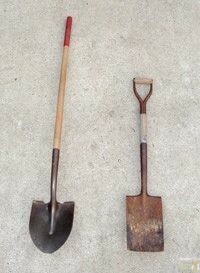 Using a shovel for planting shrubs and perennials. 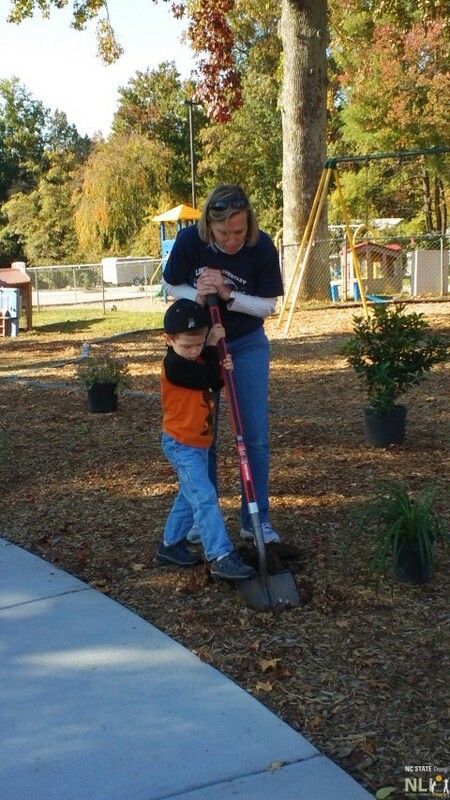 These volunteers are using a pick mattock and a shovel to loosen the soil in a planting bed. 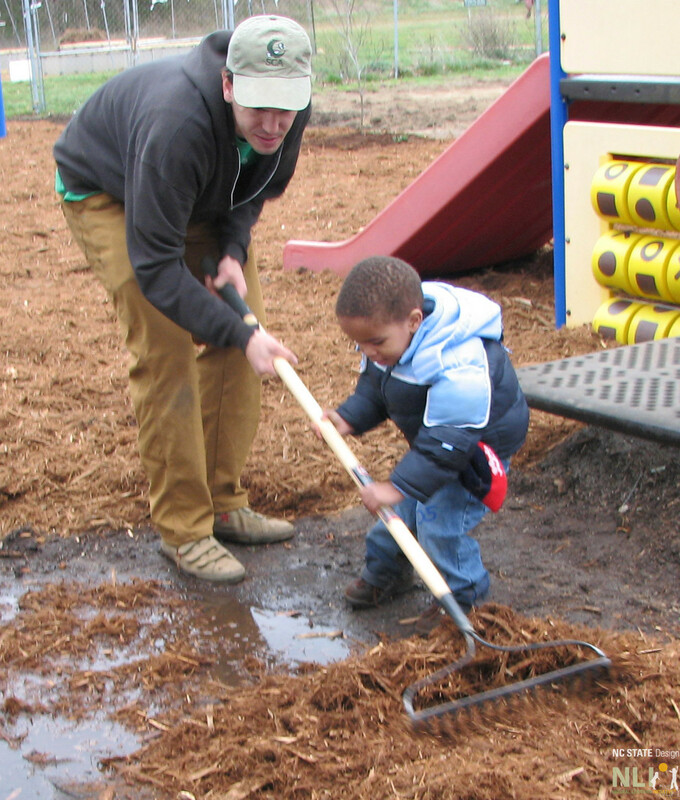 Using a bow rake to spread mulch in a play equipment use zone. 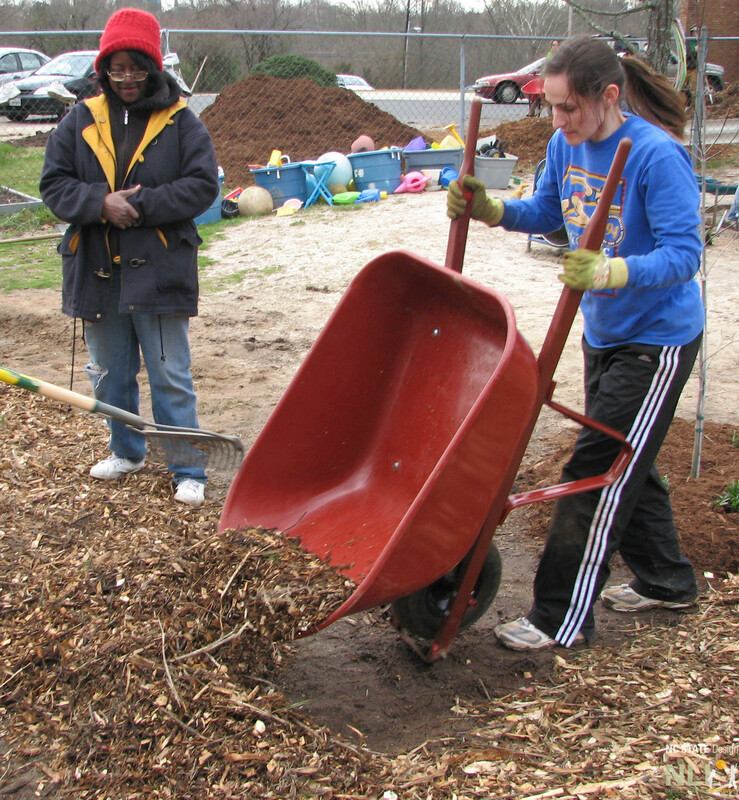 Wheelbarrows are useful for loading and moving loose material, such as mulch. 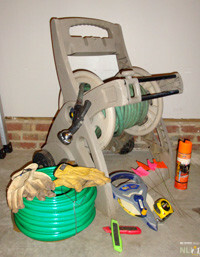 Hand tools are less expensive than power equipment, often serve multiple uses, and are easier to use in small spaces. In addition to those listed below, these may be useful for specific tasks, as well as in later maintenance and/or cleanup: Crow bar (or pry bar), Garden hoe, Trowel and Push broom. Round point shovels have sharp edges and triangular or rounded points. They are used to dig holes, remove plants and scoop loose materials, such as dirt, mulch, or sand. 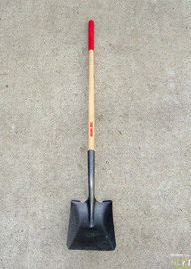 Square blade shovels are used for scooping loose materials, such as dirt, mulch, or sand. 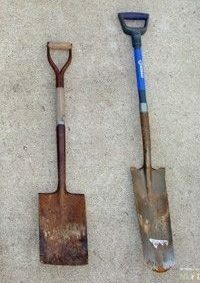 Garden spades have flat, sharp blades that are generally narrower than shovels. Garden spades are great for digging holes, particularly in tough soil, and creating sharp, clean edges along planting beds. 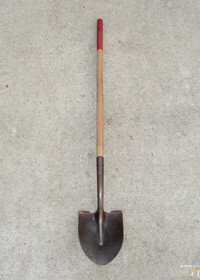 Generally, long-handled shovels are preferred to short-handled shovels. Long-handled shovels tend to be more efficient, because they are lighter and keep the user in an upright position. Short-handles are ideal for tight quarters, think wartime trench or coal mine, but can be easier for smaller people to control. See this web page for more info. 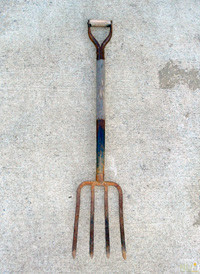 A pitchfork has a long handle and long, thin, widely spaced, pointed tines. Pitchforks are can be useful for loading mulch into wheelbarrows and pitching it into place. 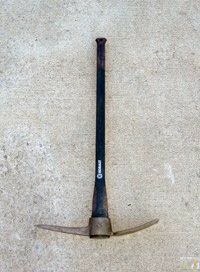 A pick mattock has a metal head with a pointed end (pick), used for breaking up hard surfaces or objects, and a flat end (adze), used for breaking up soil and prying. Pick mattocks can be used to dig holes and trenches, “hand-till” soil, and break up hard surfaces or objects, such as concrete or rocks. 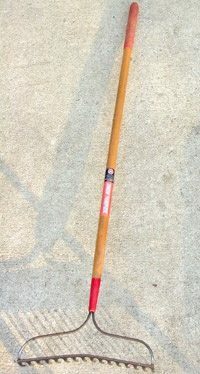 A bow rake has a long handle with stiff metal tines. Bow rakes can be used to evenly spread loose materials, such as soil, sand, and mulch. 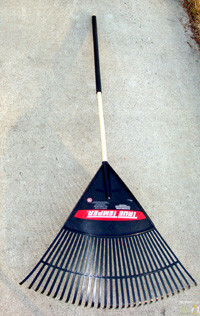 A leaf rake has a long handle with flexible metal or plastic tines. Leaf rakes can be used to gather or spread loose materials, such as leaves, soil, sand, and mulch. 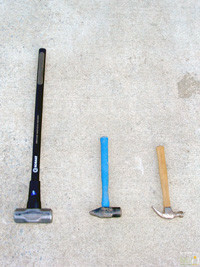 Hammers are available in various weights and shapes specific to their intended task. Some hammers are used for driving nails, while heavier hammers (such as sledgehammers) are used for breaking concrete or driving stakes. Power equipment make particularly difficult or labor-intensive tasks easier, requires fuel, electricity, or batteries, and can be rented from tool rental centers. Power equipment should be used with caution and only by adults familiar with its function. Rototillers are used to break up soil and uniformly mix in amendments. A rototiller has engine-driven tines that break up soil and propel the machine forward. The operator walks behind the rototiller controlling its speed and direction. Rototillers are particularly useful for preparing large planting beds or gardens. A vibrating plate compactor has a large vibrating baseplate used to compact loose materials, such as soil, gravel, and sand. The operator walks behind the vibrating plate compactor controlling its speed and direction. They are particularly useful for compacting the base and surface layers during pathway installation. A skid-steer loader (generically called a Bobcat) is an engine powered machine with lift arms and various attachment tools. Skid-steer loaders have many onsite uses including hauling large objects, such as trees and boulders, and loose materials, such as mulch and gravel, and excavating pathway beds. Everyone working in the outdoor learning environment should own a pair of well-fitting, quality work gloves. Work gloves are sized and can be tried on in the store prior to purchasing. Leather gloves tend to be more durable and offer better protection. Measuring tapes come in various lengths and styles. Both 25’ and 100’ measuring tapes are useful when laying out the outdoor learning environment. Wheelbarrows and garden carts are used to haul heavy and/or loose materials. They make hauling heavy loads easier and are quite versatile. Garden hoses are used to water plants and for temporarily marking pathway edges during layout. Survey flags are used to temporarily mark plant, setting, or pathway locations during layout and installation. Spray marking chalk is used to temporarily mark plants, settings, or pathway locations during layout and installation. Rain or heavy use can remove spray marking chalk, so installation should occur soon after it is used for marking.